The West Zion Mennonite congregation at Carstairs, Alberta began services and formally organized in 1901. The first building was occupied in 1902, with a subsequent building program in 1932. Israel R. Shantz is considered the founding leader of the group. The congregation originated through colonization of Alberta from Ontario. The first Mennonite to settle in the Carstairs-Didsbury area was Andrew Weber, who came from Ontario in 1894. The main settlement was made in April 1901. The congregation was unusual for its time, as half the membership in the 1950s was of British descent. Ministers who served prior to 1960 included Israel R. Shantz, Amos Weber, Moses H. Schmitt, Noah R. Weber, Henry Weber, Allan Good, Norman Buschert, Alvin Steckly, Abe Reist, Ezra Stauffer, Linford Hackman, Henry J. Harder and Gordon Buschert. Stauffer, Ezra. History of the Alberta-Saskatchewan Mennonite Conference. 1960: 36. Stauffer, Ezra and Marlene Epp. "West Zion Mennonite Church (Carstairs, Alberta, Canada)." Global Anabaptist Mennonite Encyclopedia Online. July 1986. Web. 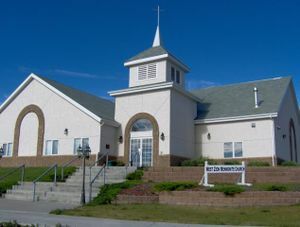 20 Apr 2019. http://gameo.org/index.php?title=West_Zion_Mennonite_Church_(Carstairs,_Alberta,_Canada)&oldid=141697. Stauffer, Ezra and Marlene Epp. (July 1986). West Zion Mennonite Church (Carstairs, Alberta, Canada). Global Anabaptist Mennonite Encyclopedia Online. Retrieved 20 April 2019, from http://gameo.org/index.php?title=West_Zion_Mennonite_Church_(Carstairs,_Alberta,_Canada)&oldid=141697. This page was last modified on 6 December 2016, at 04:51.